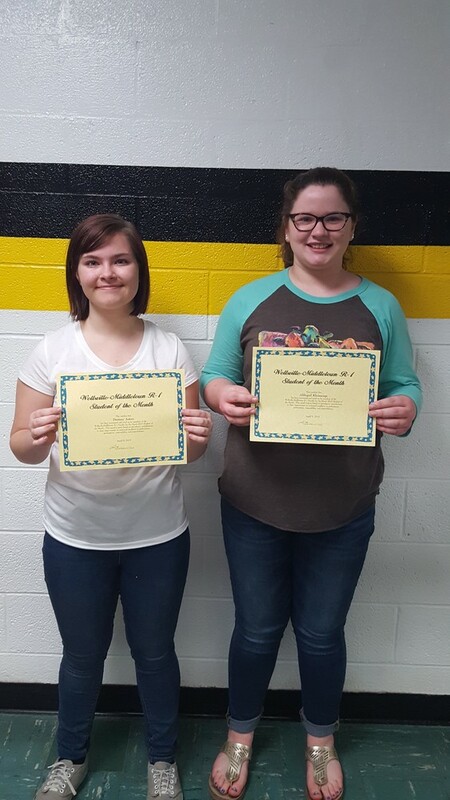 The March 2019 Students of the Month for Wellsville-Middletown Jr/Sr High are Destiny Aston (JH) and Abbigail Kleinsorge (HS). Mr. Mountain nominated Destiny for “always coming to band prepared and ready to tackle whatever music she is asked to play. She showed huge perseverance when it came to auditioning for and participating in the North East Missouri JH honor band with nearly 50 other clarinet players and came through more excited than ever to keep learning and playing in band.” Destiny is the daughter of Sandra Rose of Wellsville. Destiny is currently a 8th grader and is a member of the the cross country team and band. Destiny attends the United Methodist Church of Wellville. In her spare time, Destiny enjoys hanging out with friends and family, binge watching Netflix, reading everything, and writing fantasy stories. Abbigail was nominated by Mrs. Bohr for “always willing to help out and going above and beyond when working on a project. She is a positive influence on all that are around her. Abbi always represents our school well when out in the public and on extracurricular activities.” Abbigail is the daughter of David and Kristen Kleinsorge of Middletown. She is currently freshman and involved in FFA, Specdra, and the Middletown Meddlers. She is active at St. Joseph Catholic Church and Youth group in Martinsburg. In her spare time, Abbigail enjoys hanging out with friends and family, working on the farm, and working with her fair steer. The criteria for student of the month are high attendance rate for the month, contributes to class, club, and/or athletic activities, showed marked improvement or continued excellence in performance, is prepared for class, class participation, demonstrates responsibility, and is respectful to peers and teachers. Thank you to Dairy Mart for donating a cheeseburger meal to this month’s winners. Please help us in congratulating Destiny and Abbigail on their accomplishments. Keep up the good work!